Celebrate with a Pretty in Pink-tini! Last weekend we headed out to the Phoenix Open. If you're from the area you probably have experienced it first hand. If not, let's just say it's not your usual golf tournament. It's more like a cross between a football game, nightclub and maybe a day wedding. There's cheers, beers mixed with some sunshine and friends. It's a lot of people watching and many drinks are served. We got there about 9:30 and as soon as we arrived at our tent, the husbands headed to the bar. I wasn't feeling it but the bartender gal was insisting I partake in something. She kept trying to entice me with - fill in the blank. I finally said okay (maybe just to shut her up) when she got to orange juice and vodka. I thought, The Real Housewives of ____ would go for it, why can't I, live a little Nicole! Well… I tried it. Not my style. Drinking a Mimosa is one thing - that was another. Needless to say, I didn't finish the drink. I like cocktails that are a little more planned out. There needs to be a slight recipe involved. I have never been a girl that bellies up to the bar and says give me a blank and blank. Nope, I need a drink with a cute name. Maybe that makes me a pain, maybe it just makes me One Picky Chick! For this Valentine's Day I've got a great drink with a super cute name. Here's my theory on Valentine's Day. It is meant to be celebrated. Whether you're "in" love or not! If you have a special someone, great. If not, grab your best girlfriend and celebrate her. Or maybe tell mom how much you love her, or heck - that cool neighbor down the street who took in your trash when you were on vacation last summer… invite them over! He or she deserves a cocktail too! Yes, my friends, February 14th is a perfect time to party- with whomever you want! Now, nothing says PARTY like a yummy cocktail. And this one is major yum. Plus so pretty… look! Because it is so pale-pink-pretty… I found it super appropriate for this Valentine's Day. I also love the name but if you wanted a less flashy, more descriptive name for it - it would be called Basil Grapefruit Martini. But hello - BOOOOORRRIIIIING! Now, we must go over the one thing that makes any cocktail worthy of drinking. Can we say it all together now because I don't make a cocktail without it. Wait for it….. and… now…. 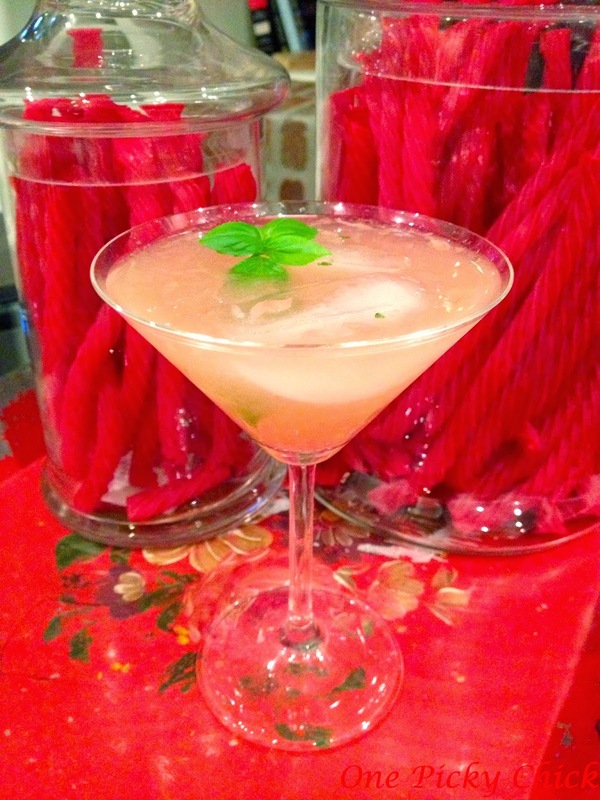 In this drink there are two - grapefruit and basil. 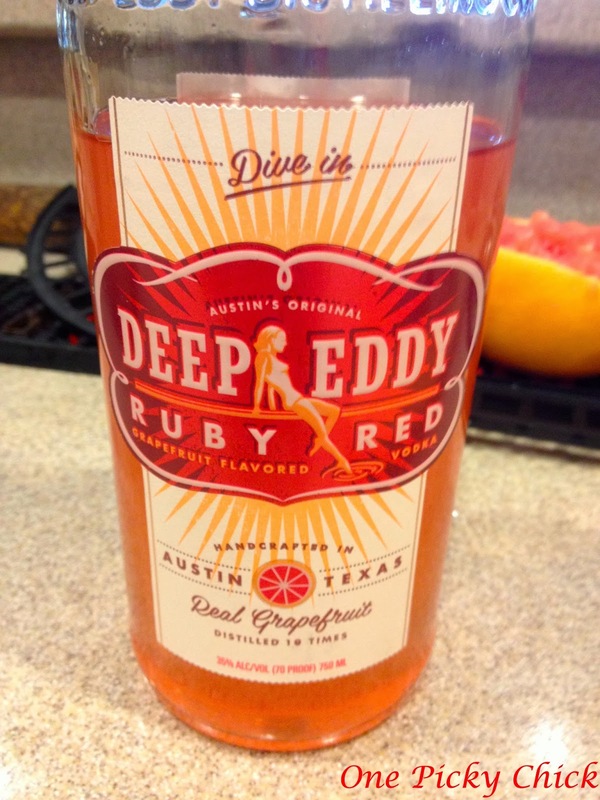 Deep Eddy's Ruby Red Vodka! Good stuff. I bet if you mixed it with Sprite or Club soda it would fly - hey maybe next year at the Phoenix Open! But … alas, that's not what we're doing here. First, if you're using simple syrup, make that. It's so… ha ha… simple. 1 cup of water and 1 cup of white sugar. Combine them into a sauce pan. Boil them. Stirring here and there. 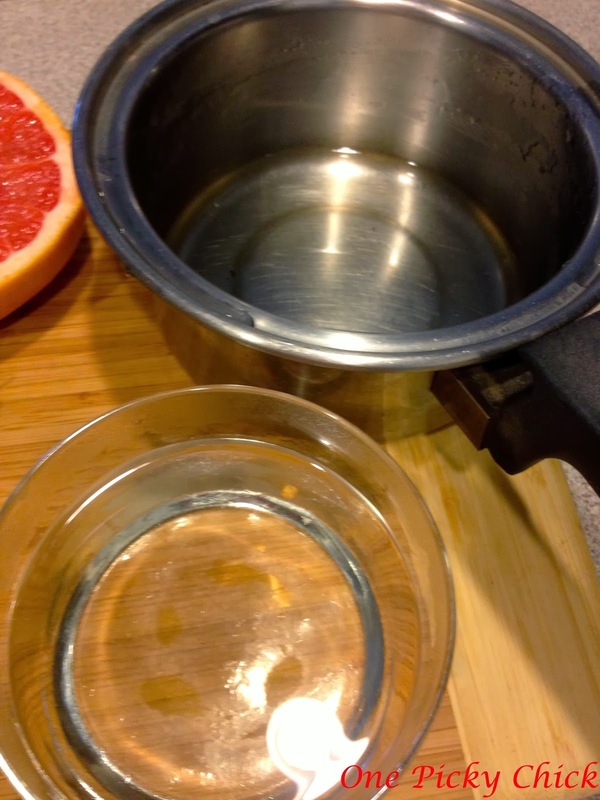 Once the sugar is fully dissolved, remove and cool. You can barely tell but both the bowl and sauce pan below have the clear simple syrup inside! Now, take about 10 basil leaves and either muddle or tear apart and put in shaker. 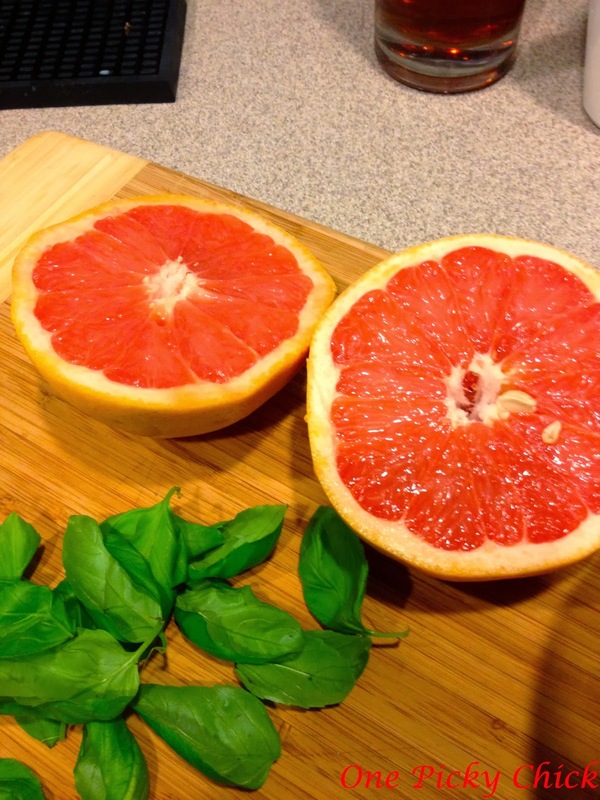 Follow that up with squeezing both sides of the grapefruits into it! Get some of the pulp and every last bit of juice possible! Then, add your shots. Deep Eddy's or your choice of regular vodka. You may want to taste it here to decide how much simple syrup or agave you need. Deep Eddy's makes the drink sweeter than regular vodka so if you're using that - 1/3 or LESS of a shot glass filled with either SS or agave should be fine. Regular vodka may require a bit more SS or agave… depending on your taste. 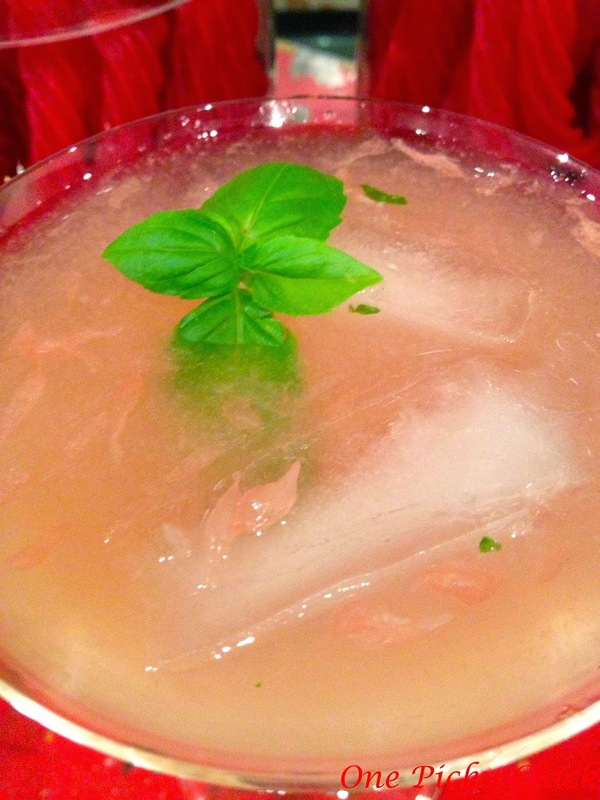 Once ready, pour into your (2) glasses of choice, with ice inside, add some basil to garnish on top and your Pretty in Pink-tini is ready! Your date, whomever that is, will be so excited you took the time to make a special effort on this day of love. So much better than OJ and Vodka, I promise they will heart you forever!